The book: Before Dan Brown or The Bourne Identity, John Buchan got the ball rolling in the man-on-the-run conspiracy novel sub-genre in 1915. 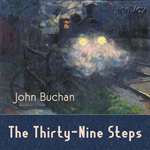 The 39 Stepsfollows Richard Hannay, a South African mining engineer who has moved to London to start a new life. Hannay finds this new life dreadfully boring until he crosses paths with a secret agent who has uncovered a shocking conspiracy. Soon, the shadowy members of the Black Stone are on the trail of Hannay and he must discover the meaning of the phrase “the thirty-nine steps” before time runs out. This was a fun light read. The plot relies far too much on serendipitous circumstances to be believable, but the story is exciting and fast-paced enough to let the ridiculous coincidences slide. Buchan strikes the right balance between making Hannay competent enough to be interesting without making him a do-everything superman. I can easily see how this novel became a favorite among soldiers in the trenches of World War I: it’s great escapist fiction. The reader: As I mentioned in my review of Treasure Island, Praetzellis is probably the best narrator at LibriVox. In fact, I’d put him in the top 10 of all narrators working in audiobooks, professional or amateur. He does wonderful voices for each of his characters, from a deep Scottish brogue to the received pronunciation of government officials. I’ve read this book before in print and don’t remember enjoying it near as much as I did from Praetzellis’s narration.